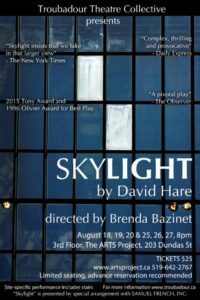 The intimate third floor space at The ARTS Project with its exposed yellow brick, floor-to-ceiling windows, and old wooden floors provides an exquisite backdrop for David Hare’s Olivier and Tony Award winning play Skylight . Set and Props Designer Alina Subrt has done an exceptional job of creating the shabby Northwest London flat of Kyra Hollis (Francesca Ranalli), a 30-something East Ham schoolteacher. Tom Sergeant (Jeff Miller), a successful restaurateur and hotelier is shocked and disapproving of Kyra’s minimalist life when he unexpectedly appears at her door one evening in the dead of winter. He cannot understand why she would forsake the life of luxury she had when she lived with him, his wife, Alice, and their two children, to live in cold discomfort and teach students on the bottom rung of the socio-economic ladder. Kyra had been Tom’s employee, close to both him and his family, but also his mistress. Once discovered Kyra fled, but one year after Alice’s death Tom has come in search of the girl he lost. The actors, under the direction of Brenda Bazinet, do a masterful job of moving toward and away from each other in a dance of remembered desire, betrayal and fundamental differences in character. The play is bracketed by the appearance of Edward Sergeant (Jeff Dingle), Tom’s angst-ridden teen son looking for answers to Hollis’ quick and unexpected disappearance from his life, thus shedding light on the collateral damage of the affair. Edward’s final appearance with a basket of things that Kyra tells him she misses from her old life—scrambled eggs, bacon, toast wrapped in a white napkin—felt as much like closure as it did a new beginning. The dialogue, at times witty, at times raw, is always authentic and flawlessly delivered, providing an immersive and engaging audience experience. Recently formed Troubadour Theatre Collective cites its mission as “sharing professional theatre and opera in intimate, immersive and varied site-specific venues,” to allow for an arts experience that “should be powerful, visceral and transformative.” Their production of David Hare’s Skylight is definitely in keeping with that mission.